Two basic types are offered, the Shield Anchor and the Throughbolt, both working on a similar principle of an expanding sleeve for fixing into concrete flooring. 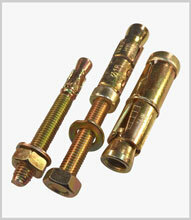 They are also known as wedge anchor bolts. Materials: Carbon steel, zinc plated and hot dipped galvanised, also stainless steel.